Water Rail (Rallus aquaticus). Taken at Farmoor, Oxon., on December 31st 2018. Taken at Farmoor, Oxon., on December 31st 2018. The Water Rail is smaller than a Moorhen. It has chestnut-brown and black upperparts, grey face and underparts and black-and-white barred flanks, and a long red bill. It can be found in suitable habitat in most of the British Isles. The winter population is augmented by birds from continental Europe. 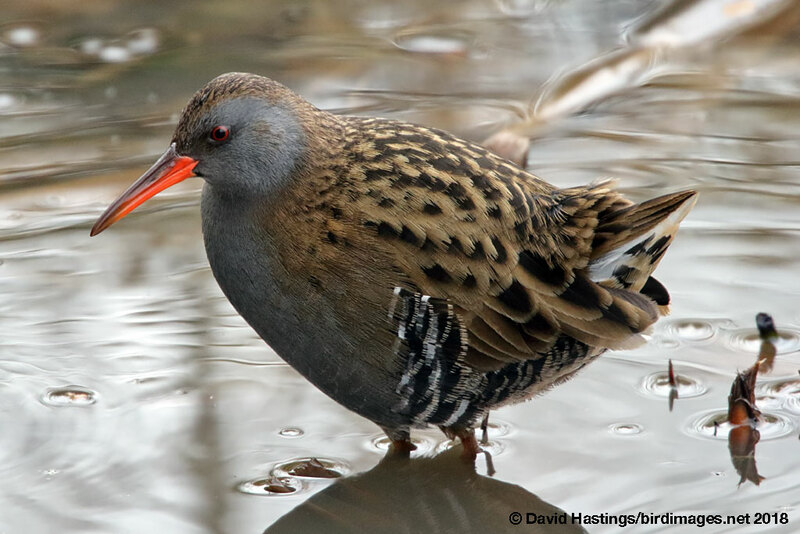 The Water Rail's breeding habitat is marshes and reedbeds. It nests in a dry location in marsh vegetation, laying up to a dozen eggs. Water Rails are very secretive in the breeding season, being mostly heard rather than seen. They are noisy birds, with a rich variety of sounds including a distinctive pig-like squeal. They are easier to see in winter, especially if freezing conditions push them to the edge of the reedbeds. There are 1100 breeding pairs in Britain. It has green status on the British list.